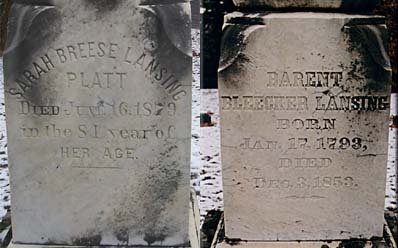 Barent Bleecker, second son of Colonel Garret G. Lansing, was born Jan 17, 1793, and had been a clerk for William G. Tracy, at Whitesboro, before joining Mr. Platt in business in Utica. After their separation, he was a short time in trade in Rome, but returned to Utica about 1822, and opened a store just below the Ontario Branch Bank. In this he was unsuccessful, and after a short service as bookkeeper of the United States Branch Bank, he became cashier, about 1835, of the Bank of Belleville, N.J. Thence he was called in December 1836, to the cashiership of the Oneida Bank, and filled the place until his death. Henry Livingston Lansing, a native of Rome, N. Y. The father of the subject of our sketch, Barent B. Lansing, was a native of Herkimer connty, N. Y., and was the son of Colonel Gerrit G. Lansing, an officer in the War of the Revolution, and who served gallantly in the "forlorn hope" at the battle of Yorktown, Va.,attached to Colonel Alexander Hamilton's command. Colonel Lansing married a daughter of Edward Antill, who was a granddaughter of Lewis Morris, esq., the first governor of New Jersey, at the city of Albany, N. Y., in the year 1786. Edward Anti11 was also an officer in the War of the Revolution, being the lieutenant colonel of a regiment, the origin and condition of which was different from any *other in the service, it being unattached to the quota of any State, was raised and recruited in Canada, and made up entirely of Canadians, and was known and called "Congress's Own." Colonel Lansing had by his wife, Mary Antill, three sons, Richard R., Barent B., and Edward Antill. 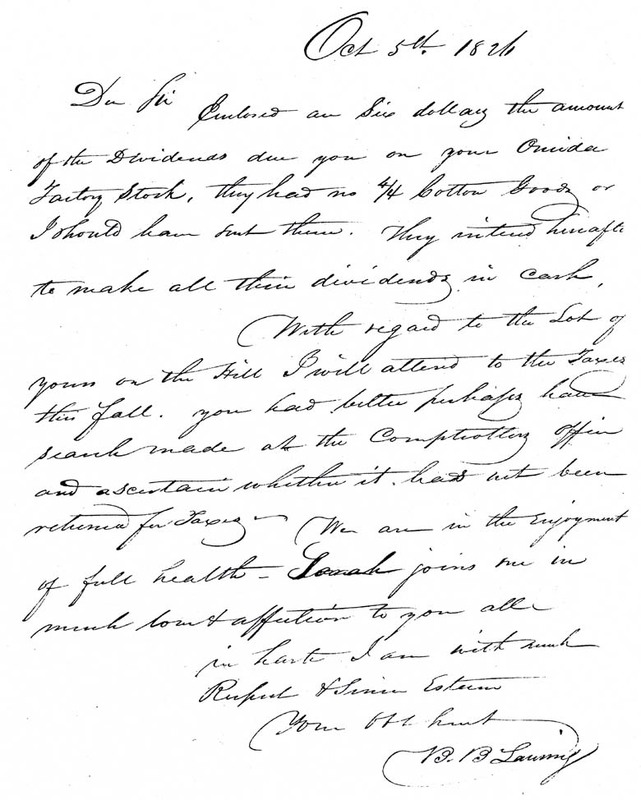 The second son, Barent Bleecker, was born at Oriskany, N. Y., in the year 1793, and in the year 1815 married Sarah, daughter of Arthur Breese, esq. At an early age he was clerk for William G. Tracy, esq., at Whitesboro, and after that engaged in business with James Platt, esq., of Utica, N. Y. This partnership lasted only a short time and subsequently Mr. Lansing accepted an offer and became cashier of the Bank of Belleville, N. J., and from there he was called to the cashiership of the Oneida Bank, Utica, which place he held until his death in 1853. Mr. Lansing died at the house of his daughter, Mrs. Charles W. Morse, the wife of the eldest son of Prof. S. F. B. Morse, at Brooklyn. His remains were taken to Utica for interment and were buried from the Presbyterian Church. The stores were generally closed on the day of his funeral as a voluntary tribute of respect for one who had many friends and no enemies. Mr. Lansing had a loving and affectionate nature and was distinguished for honesty and truthfulness. He was the father of five children: Arthur B., Henry Livingston, Henry Seymour, Manette Antill, and Barent B.